Has anyone tried the new Yaesu FT-4X (dual band) or FT-4V (2m only) handhelds for SOTA? They are about £60 and £50 respectively which seems pretty good value. No doubt Yaesu are trying to compete with Baofeng. I would wonder if it were as sensitive as the FT65 and others. How does the front end respond to nearby radio masts? Is it too small to use with gloves in bad weather? But at the price I might be tempted anyway as it is bound to be an improvement on my Baofeng. Go to the specs if you want that information. This is the wrong place to ask. This is the right place to ask. I want real world experience, not the manufacturer’s claims. I think it’s really simple. For me, if I haven’t seen the set work in an icky RF environment typical of many SOTA summits or I have a report from someone I think is competent enough to walk and chew gum at the same time, then I would not spend my money on the radio. That is unless it had some other amazing feature I needed. I’m sure there are many handies that are fine and many that are rubbish. It’s not something where you can say Yaesu is fine but Icom is rubbish as the individual models vary. I seem to have had a lot of Yaesu gear. I have an old Yaesu VX170 that is bullet proof, the replacement FT270 is bullet proof. The dual band, dual mode FT70 is reported to be unaffected. The old FT60 is bullet proof too. I know the old Kenwood TH79 dual band handheld is bullet proof. I had a Yaesu FT470 which was unusable near other VHF services. And Icom IC80 which was terrible. I still have an Alinco DJ-G7 which is quite unusable on 2m but I only use it for 23cms. My old Yaesu VX-1 is iffy in such environments. Until you can find someone who has one and has used it in an RF rich hilltop, I would keep my wallet tightly closed. My vx170 has been incredibly reliable. Do you get reports of ‘quiet audio’ Andy from the folks on the other end of the qso? Many times I get told the rf is strong but the audio is quiet? I always put it down to the waterproofing? I have a FT-4XE on the way, should be here tomorrow. If you’ll wait a couple of days I’ll play around with it and post some impressions. Can you test it in the rain next to a large pager site please! Do you get reports of ‘quiet audio’ Andy from the folks on the other end of the qso? Only just spotted this question. Yes and no. I am aware of the muffled audio reports due to the waterproofing so I just bellow into it in my best Brian Blessed impersonation! Works for me. RF frontend seems to be on the same level with the Kenwood TH-D7E and definetely better than Baofeng UV5R or even the Kenwood TH-F6E. This is relative, based on known VHF/UHF spurs around the house and how they affect RX on each radio. Not sure when I’ll get to the first summit with pager towers, so that will have to do for now. VHF RX sensitivity (when not affected by the livingroom TV aka “tactical jammer”) seems to be on par with all the radios above. stock antenna makes poor contact at the SMA center pin, I think they went for the cheap stuff here. Just a minor mechanical issue, fixable, but it can kill the final stage. Serious problem ! keypad is hard to use because the buttons are small, rubbery and soft, have a lot of travel and there are guards between each column. Vastly inferior to the Baofeng and about any radio I’ve had. No chance to use the keypad with gloves. more bad: Menu key is on the side, next to PTT and Alarm. When in the menu, short press is OK and long press is Back. The manual actually says to use PTT for Save (!). instead of having the secondary function of the button written on it, there are letters like on old phones. That is because most keys don’t have secondary/tertiary functions, but the few ones that do you’ll have to remember (like long press 6 is LOCK). To change the output power you’ll have to go deep in the menu, it’s not important enough to be a secondary function. Talking about the menu, it’s sorted alphabetically so related functions are not grouped together. DCS at 10 but Repeater Shift at 31, because it’s fun to go up-down through the whole menu for two repeater-related functions, with that awful keyboard, on that awful 6-character alphanumeric display. If the guy that thought that out would build a car, it would have the brake pedal in a submenu at number 17 and it would require about 6 key presses to enable it. Ignoring the antenna connector problem I’d say It’s a good radio with a bad user interface, suited for infrequent use. PS: Baofeng/Kenwood accesories won’t fit, it has different battery and audio connectors. Antennas are interchageable and the UV-5R can be charged in the FT-4X desk charger (but not the other way around). 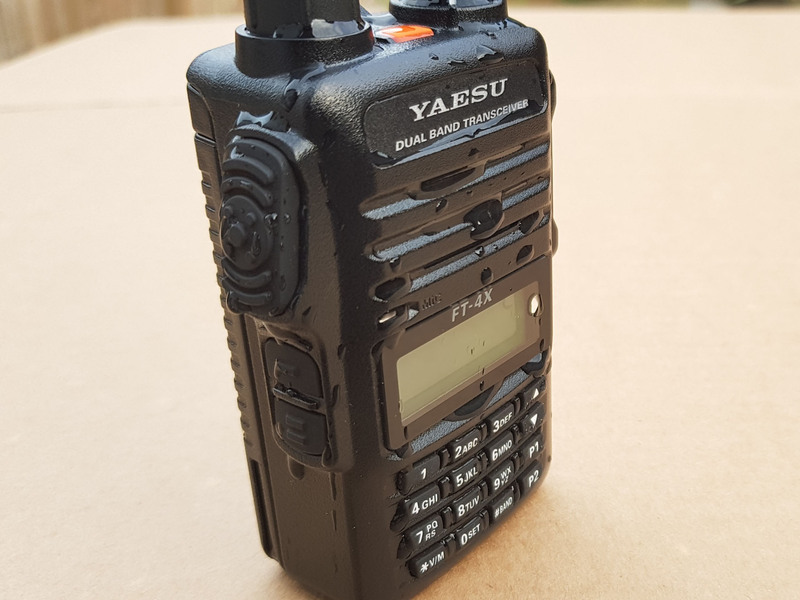 I had the chance to test the Yaesu FT-4XE, Yaesu FT-60E and the Baofeng UV-5R at the same time on the same mountain summit, near a VHF broadcast site. All radios were on their stock antennas and with medium squelch settings. The conclusion is the FT-4XE is somewhat better than the UV-5R in terms of front-end performance, but it’s definitely far from the FT-60E. The FT-60E was the only one that didn’t seem desensitised and the squelch didn’t break open permanently.